Today, the world will observe the insane possibilities of a truly Digitalized democracy. In a scale never seen or heard in India, Govt. is all set to kickstart massive Digitalization program across the country today. At 4 PM in New Delhi, PM Modi will inaugurate Digital India Week, wherein Government’s Digital India vision would be showcased infront of 400 dignitaries. As per the IT Ministry, Rs 2 lakh crore of fresh investments is expected during the next 7 days. 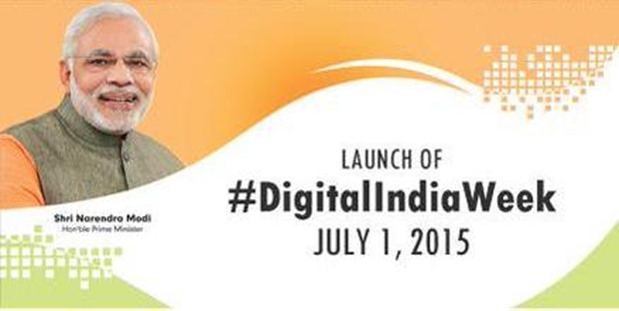 This is over and above Rs 1.5 lakh crore budget already announced for the Digital India vision last year. Thus, the next 7 days will see an inflow and exhibition of around Rs 3.5 lakh crore worth of Digitalization initiatives across the country, supported by both the Govt. and private players. Some of the dignitaries who would be attending this event: Microsoft CEO Satya Nadella, Airbus Group CEO Tom Enders, Tata Group Chairman Cyrus Mistry, Reliance Industries Chairman Mukesh Ambani and Wipro Chairman Azim Premji. Overall, 10,000 who is who of Indian and International Corporate bigwigs would grace the occasion. Invitations have been sent to Bill Gates and Narayan Murthy as well, but they won’t be able to attend the event due to time constraints. Overall, 1500 VVIPs would be present, which includes 50 ambassadors and high commissioners. The Department of Electronics and IT (DeitY) has revealed that Rs 2 lakh crore worth of investments would be announced from domestic as well as International companies. Inspired by the magnitude of the program, similar events would be held across 36 states and 600 districts. Some of them being: Entrepreneurs from Tamil Nadu will attend the event; Kerala Govt. will launch different plans; Karnataka to hold several events; Telangana will announce new plans; Associations in Jammu & Kashmir are planning events. All Universities and Colleges have been asked to provide arrangements for screening of the event at their respective locations. In fact, UGC had even issued a circular on this and shared it with every possible college and varsities. Mumbai University has also launched an app for spreading more information about the Digital India week among students. The objective and purpose of this mega event and drive is to create awareness about Digital possibilities, and to spread knowledge about E-governance initiatives. Plans regarding e-education, e-health, telemedicine would be shared, along with e-locker facility, e-filing of all mandatory Government forms, WiFi plans for future, update on National Optical Fiber Network (which is currently being implemented); spread of high speed broadband in rural areas at discounted rates and more. This is easily one of those unprecedented moments in the history of Indian business and technology, which can totally alter the way our economy is growing forward. We are eagerly looking forward to this event, and strongly encourage all our readers to watch it too. The new dawn of digital era can pave the way to a new future. "Dawn of Digital India: PM Modi To Inaugurate Digital India Week Today; Rs 2 Lakh Crore Investments Expected", 5 out of 5 based on 1 ratings.